The key to the success of any relationship is in the foundation. Establishing the right foundation can be the difference between total success at integrating a VA vs getting less than great results and not realising the value with your business. In today’s session we cover the 7 Steps to integrating a new VA into your business and the step by step method from initial employment, all the way through to your VA performing like a well oiled machine. Hey David Judge here and in this conversation we’re going to discuss how to integrate a VA into your team. Let’s make an assumption… and say you’ve decided you want a VA, you’re either using an service to manage your VA (a service like ours), you may have used a service like oDesk and you’re wondering how you’re going to integrate them into your team. For a lot of businesses this is a really important stage as it can be the make or break it for the business as a VA is may be integrating into an existing team. This is also the same deal if you’re employing a VA as a sole business owner as you to ensure they help you in the areas you need within your business. Let’s break this down into a few key areas starting from the very beginning all the way to the stage where you’re VA is performing like a well oiled machine for you and how you can achieve that. Ok, so the first area would be to mention it to your existing team. This is obviously optional as if you’re a one man (or woman) band you’d just be sitting talking to yourself. When you talk to your team I would always position at the beginning how they are going to integrate to ensure you get maximum buy in at the same time helping the relevant team members to understand how they will assist with the upskilling of the new team member. In a lot of ways a VA is there to support your existing team so they can focus on other ROI tasks and it’s important to convey that to your existing team. I’ve actually created a video previously ‘HERE’ where I share how you can identify the best tasks for a VA to perform within your business. If you have followed step 1, your team can help you to flag this for you. This allows you to understand the full series of tasks you will have your VA complete at the beginning rather than creating tasks to keep them busy. Remember, we want to target the tasks that will relieve your business in one way or another. This is where you take the tasks you have decided you would like your VA to perform and actioning the training of those tasks. We’ve found it usually works best to have a single point of contact in the upskilling process to ensure 1 clear concise is delivered. At this stage of the process if you employ your VA through a service similar to my own, we would identify the tasks we are able to upskill with your team (as we have a substantial support team). We would then create a training plan of the tasks we will upskill your team member in and the remaining tasks that would require an additional team member to train that task around. You can use this step to ensure the tasks that need to get done are getting done at the right times and is one of the most important steps. This is really simple at the same time is a critical part of ensuring your VA is performing within your business. On the flip side you can also use this step to ensure your VA is completing each of the required weekly and monthly tasks up to the require spec and time, based on your existing teams experience. This really an extension of number 3 and 4 where you’ve flagged the tasks and who will upskill your new team member. For it to all come together it’s important you invest a little time to upskill, troubleshoot and communicate with your new team member. Yes, once you’ve gone through the steps of establishing the foundation and up-skilling your VA it’s important to ensure your staying in touch. This is the way that suits you best with my personal favourite One On One Voice also know as talking to each other. I find a quick 10 minute conversation is the equivalent of half a dozen 2 way emails and can overcome any potential miscommunications. I like to stay in touch with my team a minimum once a week and have mentioned the same thing to every client as this ensures your VA continues to stay aligned to your goals, objectives and is completing the required tasks the way you want them completed. As your VA is upskilled you will want to ensure they are seamlessly working within your existing team offering access to the same softwares that will allow your VA to work within your team. If there are ever any security concerns you can use a program like Teamviewer on a terminal (which means a computer in your office) that allows your VA to connect to a computer locally and work as if they were sitting within your office. This also allows your team member to complete local tasks like mail merges and printing of double sided documents for you to send or drop off to leads locally. 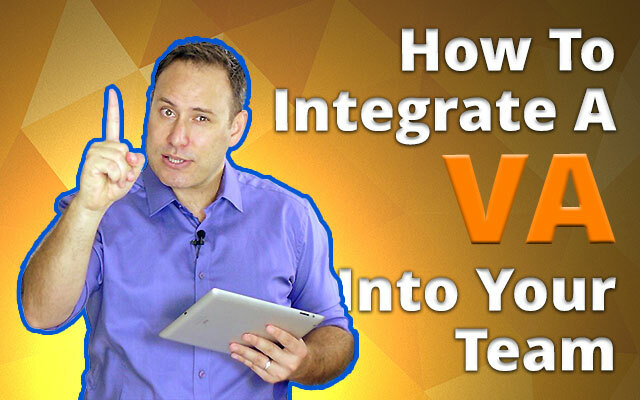 So there we have it, the 7 step process to integrating a VA into your team and I have used this same process over and over again to ensure you are getting the most out of your VA at the same time helping them to integrate into your team. In the next session we’re going to discuss the specific tasks a VA cannot perform. This will be an interesting conversation where we discuss the key areas we’ve found a VA’s are not able to perform within a business and other areas that a VA can, but will need guidance around.